I am so nervous. Normally when I release a game, there is just the distant sound of tumbleweed and a handful of people who give a try after playing the demo. This time I am bombarded at all directions from people who really want to play the game. This is a beta copy of the game that you are getting. It is not final. There are some bits which I’m not 100% happy with (are we ever?) and I will probably overhaul a few sections of it before it’s actually given a proper release. 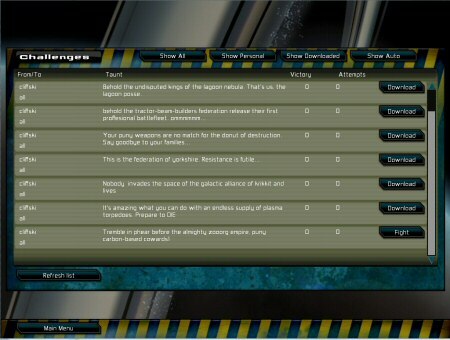 The game has an on-line challenge system, and that’s a new thing for me, so expect some teething problems. All of this has been tested, and works, and seems bug free, but you simply can’t plan for the reality of people on-line connecting from all over the world to do stuff with PCs and the interwebs. You might find some weapons, hulls, modules unbalanced. I’ve played a lot of battles and think it’s balanced, but maybe I’ve never even thought of building a ship with 16 point defense turrets, so didn’t spot what a super-overkill combination that can be. Obviously through the course of the beta, the game will get heavily tweaked and rebalanced. Finally, this is an indie game, it’s literally a bedroom coder effort, so be gentle on the shouting when you discover something that crashes or won’t work. It’s purely because it’s something that never happened at my end, I will endeavour 100% to fix it as quickly as I can if you have any problems. If you are not happy to try out a beta copy of the game, or genuinely think your PC isn’t up to it, then please don’t get it yet, wait for a demo and the full games release. I’ll be checking my forums, and blog comments throughout today to see if there are any problems, and explaining any bits of the game that I’ve explained really badly. There IS a pdf manual, and it’s worth flicking through it. In fact, here is a copy for people who want to read it first to see what the game plays like. Obviously feedback here or the forums is VASTLY appreciated. Hopefully we can get a really good game out of this. The problem with being a lone developer is there is nobody else to cross-check stuff with. Tomorrow I’ll be putting GSB up on pre-order and beta download, so real paying gamers are going to play it for the first time. At least I haven’t pressed 5,000 CDs like you would have done in ye olde days. I’m sure a patch will be released in the first week with big fixes and updates. Even if there isn’t a single bug, I’ll be adding new and better graphics for some of the bits I’m not happy with. I’ve never been this nervous about releasing a game before, despite the fact that I think this is my best game. It comes right at the tail end of sales from my last games, in the middle of a games price-war and a global recession, with me about to move house and suddenly we are 100% dependent on games money to pay the bills. Added to this is the fact that this game probably appeals (at first glance) to the more piracy-prone slice of gamers, which can’t help. The trouble is, I’ve never been able to make games that aren’t exactly 100% what I want to play. I could have made 3 or four diner dash or zuma clones instead of GSB, but I’d just be depressed doing it, even though I’m pretty sure I’d have made a more reliable income that way. People I know who do that are doing very well out of it. It’s a bit weird (and scary) to think that my ability to buy food next month is dependent on whether people think I’ve balanced the ranges of fusion beams and multi-warhead missiles correctly. Here’s something I thought was cool it’s a step-by-step breakdown of a single frame of GSB being rendered (minus the shaders, I had to disable them to be able to do this). It’s amazing what bugs you find when you just sit and play through the game for hours (I’m playtesting and balancing the game so that the AI fleets give you a bit of a challenge). Firstly, the code that detected that an enemy target was being ‘painted’ by a target painting laser (and thus easier to hit for missiles) was just not working at all. I’d checked and double checked it many times, but because the ‘is it painted’ code is just one of about 6 factors determining optimum target selection, it was hard to tell if it was working right without stepping through everything each time. It turns out that code worked fine, but some *other* code which told a targeted module whether or not it even *was* a missile launcher, was buggy, and so the code was never even being run. doh! The second bug was investigated after I noticed some very slow missiles which looked like multiple-warhead missiles but never split into their sub-munitions. It turns out that this code has never worked correctly! The code works fine the first time a missile splits into sub-munitions, but if it gets to live long enough to shoot another missile later, the sub-munitions are never triggered. That was an easy fix. Unfortunately, that means I’ve been underestimating the destructive power of multiple-warhead missiles all the time, which means I need to re-play through every battle, on every difficulty, and both re-balance the fleets, and maybe re-balance the cost and strength of the appropriate missile modules too. This will take all of today at least. This is the current challenge list screen (click to enlarge). It’s not exactly an MMO quality on-line browser, but it’s what there is right now, at this beta stage of the game. (BTW I’m aiming for pre+orders + beta for pre-order customers as of next Monday). There are basically 3 types of challenge. 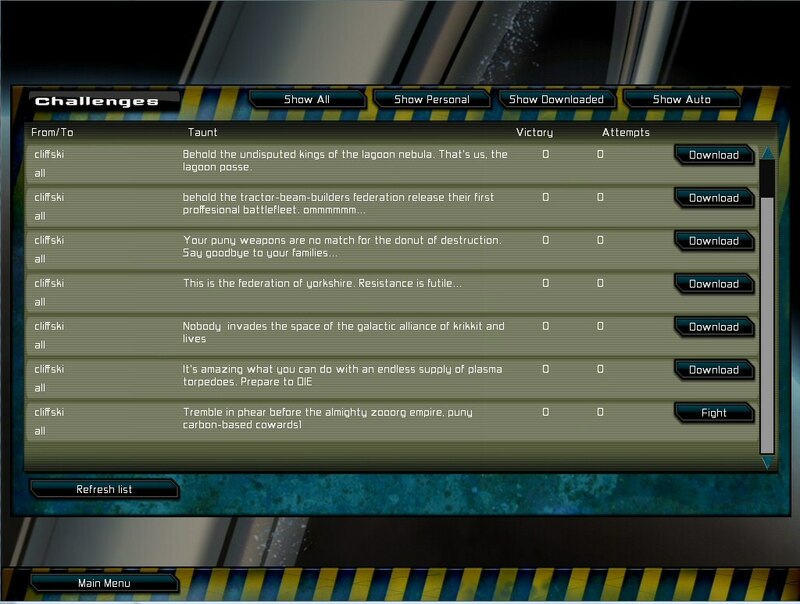 Automatic ones, open to all, which get uploaded whenever you beat an AI fleet from the game (these come from ‘auto’), open challenges where a player has posted up an open invite to beat their fleet (sent to ‘all’) or personal challenges sent to another GSB player by username. The browser downloads a list of all the challenges, and you can then filter them using those top buttons. Every time you attempt to fight against a challenge, the ‘Attempts’ is incremented globally. Every time you beat a challenge, it’s ‘Victory’ will go up. You click the download button to grab the challenge from the server and play against it. From then on, that challenge is a local downloaded one you can revisit easily. I haven’t done the code yet that means only one victory per challenge, per person can happen… must do that! I must also add a button to only show *your* challenges, so you can check on how many attempts your fleet has had, and how many people have beaten it. Ideally there would be TONS of community based features like this, it really does depend how well the game does, and if people enjoy this sort of thing. The minute there are some pre-order buyers playing the game, I’ll have a decent idea as to where to direct my energy in terms of development.